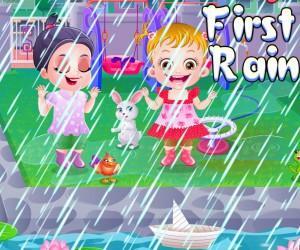 Baby Hazel Cleaning Time is an online learning game designed for young girls and boys to play. Baby Hazel has reached the age where she is learning how to do all new things. 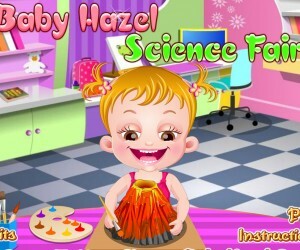 Your child will love playing this game and teaching Hazel how to take care of her home. The players will learn what they must do to take care of Hazel. There are four different areas that this game focuses on. They must tidy up the backyard, the kitchen, the living room, and the bedroom. The game has helpful arrows that hint to the player what they need to do next. This game is set up with levels where each level is a different area that requires cleaning. This game really is about doing chores just like we all do in real life. To eventually win this game, one must do things in the correct order to gain happiness points. For example, in the kitchen when mom is doing the dishes, you actually have to hand the soap to mom, put the rag in her hand, and turn the water on for her. In the bedroom, she tries to do the tidying up without any help from the mom. Each level has unique chores for you to learn that are a part of everyday life. When cleaning the living room you will help her pick up the toys that are scattered. In each level there will be times when the baby has other things she wants. Your goal in the game is to help Hazel fulfill her own needs in the game. They also help clean up the backyard in this version of the game. When children are young, experts believe they are actually able to learn much faster than adults. Their brains are more receptive to new information. Baby Hazel has adventures that include some skills your children can use later on in their life. Cleaning the house is one of those things that nobody wants to do because it’s not a fun part of our everyday lives . There are several different things children can learn in each game and level. This game is great for toddlers and primary school kids. Every parent should try these friendly, safe, and educational games! They say that “cleanliness is next to godliness” and now it’s Baby Hazel’s time to understand it. As she is growing fast she realizes the importance of cleanliness, for a healthy life. Cleaning the house and the surrounding area is as important as every other aspect of her daily life. Today our little darling is all set to offer a helping hand to her mom as she cleans the house. Help our young angel darling baby Hazel perform her cleaning activities. Enjoy!